Recognizing the importance of protecting cultural heritage from attack in times of conflict, Irina Bokova, Director-General of UNESCO, and Fatou Bensouda, Prosecutor of the International Criminal Court (ICC), on 6 November 2017 signed a Letter of Intent formalizing and further enhancing their collaboration. 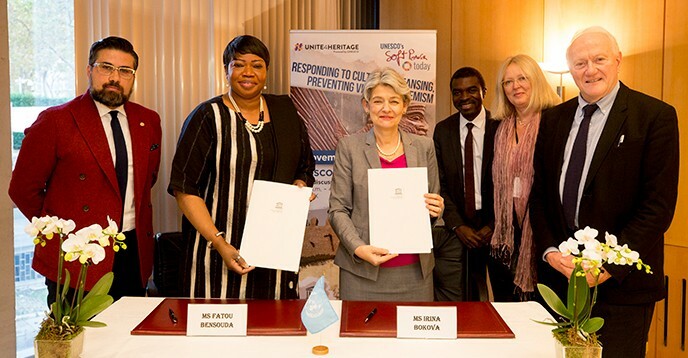 The signing of the Letter of Intent took place in the margins of an international high-level panel on “Responding to Cultural Cleansing, Preventing Violent Extremism” at UNESCO Headquarters, in which both Ms Bokova and Prosecutor Bensouda participated. “The deliberate destruction of cultural heritage not only affects peoples’ historical identity but fuels sectarian violence and hampers post-conflict recovery and peacebuilding. UNESCO and the ICC must strengthen their cooperation for the protection of cultural property in armed conflicts, as this is a humanitarian and security imperative”, said Ms Bokova. The recent historic ruling of the ICC (link is external) in the case of the destruction of shrines and mausoleums in Timbuktu (Mali), the first of its kind before the Court, sent a clear signal that intentional targeting of cultural heritage is a serious crime that causes significant suffering to those immediately affected and beyond, and should not go unpunished. The Court subsequently issued aReparation Order (link is external), establishing that the victims of such crimes were entitled to compensation. The importance of prosecuting those responsible for war crimes against cultural heritage was echoed in the ground-breaking UN Security Council Resolution 2347 (link is external), adopted in March 2017, the first ever to condemn the unlawful destruction of cultural heritage. These unprecedented developments have led over the past years to frequent exchanges and collaboration between UNESCO and the ICC Office of the Prosecutor, based on the convergence of aims within their respective independent mandates. As attacks against culture have regrettably become more frequent, the need for a stronger and more articulated framework of cooperation has become apparent. In addition to expertise UNESCO has provided in the context of the Al Mahdi case, cooperation has also been at the non-operational level, for example through participation in the ICC Office of the Prosecutor’s new policy initiative on cultural heritage, which is scheduled for finalization and adoption in 2018. The Letter of Intent signed today builds on these efforts, further solidifying the existing relationship, with a view to establishing a comprehensive cooperation agreement in the near future.